To ALL school nurses.. Questions for you, please & thank you!!! New Grad Nursing Internships/Fellowships/Programs in Maine, Mass, NH, & surrounding.. Thank you. I am aware of the one at Mass. Gen. However, I think they only offer the program beginning in June. I am finding it hard to find an intern/new grad orientation program, especially one starting in September (after an August grad. date), especially in a cricical care/ICU specialty. Anyone know of any programs in Maine or New England area? Thanks so much! How do you balance work & family life/free time? Does anyone know what hospitals in Maine and surrounding states offer new grad nursing internship/preceptorship programs? Specifically, I am looking for places that offer orientations/hiring new grads in ICU/critical care settings. Also, do you know WHEN (what months) they using hiring/start these programs? Does MMC offer one of these? I am not comitted to staying in Maine, but if I don't have to move as soon as I graduate from nursing school it would save a little money. I am specifically looking into getting a critcal care/ICU position to gain experience with a long term goal of making it to CRNA school! (The accelerated program I would be in graduates in August, so hopefully a position that starts in late August/September). Thanks! How much is malpractice insurance for a CRNA (Nurse Anesthetist) per year? How much is malpractice insurance for a CRNA (Nurse Anesthetist) per year? Does anyone know what the average cost of malpractice insurance is for a CRNA (nurse anesthetist) is per week, month, year? How does this work... do you set up the insurance and pay for it in a "bill" form... or does it get automatically deducted from your weekly pay check? I know starting salaries for CRNAs is around $115000-150000 per year, depending on where you live and work, and I am trying to get a ballpark figure of how much you take home (after taxes, malpractice insurance, health insurance, retirement, etc...) Anyone have any idea of how much you actually TAKE HOME for pay as a CRNA? Also, I know some places say they PAY for your malpractice insurance, health insurance, etc. 100% as part of your benefits... is this common? At first, I thought CNRAs were covered under Anesthesiologists, and that they didn't need malpractice insurance... but it seems that this is not the case... Thanks for your repsonses! Hi there, I am thinking of applying to USM's accelerated nursing program. I already have a bachelors of science from USM and an associates of science from another health related field. I have some questions about their accelerated program that I would be applying to start in May 2010 (Sept. 2009 Application deadline). Does the accelerated program only start in May, do they have other start dates? How many hours do you get to spend doing clinicals? How many semesters? How many days/hours per week? I looked on SMCC's website and it looks like they spend an avg. of 16-18 hours per week in clinical each semester... I am hoping USM is the same way (that you get enough clinical time)... Any input on the quality of the clinical time in USM's program would be great... Did you feel prepared enough? Any comparisons to SMCC/CMCC...? If I apply early (like sometime in March 2009), do they have any way of early acceptance? In other words, could I find out if I were accepted early and not wait until this winter? I'd like to know now so I can plan for other options in case I don't get in there. I have a degree in another health field (rad tech) and graduated from USM a year ago with a fairly high GPA... I realize the program is intense and that it is time consuming... any other input on the program would be helpful. I have already taken A&P I and II, Bio I with labs, Chem I with labs, and Physics I and II with labs, as well as a Statistics course, Human Growth & Development course, and Psychology and Sociology at USM for my previous BS degree. I also have already taken Concepts in Community Health and Health Related Research. So I have a few courses done. I have NOT take Microbio, pathophys, or pharmacology yet... Don't know if I should to help my application...? Also, my end goal is to become a CRNA after a few years expreience and going back to grad school to get my masters in Nurse Anesthetist. Any insight on this would be great as well if you have any... I am not really sure how much experience you really come out of nursing school with... I know you have to have at least 1 year of ICU/critical care nursing to apply to CRNA program... how exactly do nurses get into a "specialty". Do hospitals do some on the job training for new grads? 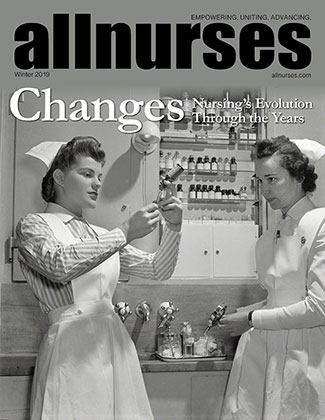 Are veteran nurses good at helping new grads with problems/new skills? I am not sure how this works.... I went to x-ray school, it was a competancy based program... we learned HUNDREDS of procedures, positions, skills, and when we graduated we were COMPLETELY prepared to do our job to its fullest without the need for help/training from other rad techs (unless you switched to another modality... such as CT/MRI/Ultrasound, etc.). I do not fully understand the "scope" of a new grad nurse, and how exactly one goes about getting into different specialties, but any advice on how a new grad could eventually get on the path of landing a critical care position as soon as possible out of college would be great. Thank you for taking the time to read through this and for all your insight. I appreciate it!